A: To freak out my neighbors.Homebrew Husband and I go on approximately one date a month, if we’re lucky. Lately they’ve been less frequent, and have included our little guy, which does take some of the romance out of the mix. Anyway, last Friday was Date Night! We dropped our daughter off for an evening of sugar-fueled merriment with other kids and walked to a neighborhood restaurant where we had a gift card. Oliver obliged by spending part of dinner asleep and we had a great time.That night, after we all returned home, I learned that our two hens went out for a night on the town, too. My neighbor across the street emailed me to let me know that she had found the chickens wandering around her yard. With some help from our other neighbors, they all herded the chickens back into our yard and into their coop. That was fun while it lasted, eh, girls? First, I have the greatest neighbors in the world, because at no point was local animal control called, and everyone involved seemed to think the poultry escapades were more amusing than irritating. My neighbor said it was quite amazing to see the chickens squeeze under a sub-6-inch-high gap between our fence and the ground to get back into our yard. I wish I had been there to see them squeeze under it to leave our yard in the first place; it would have saved my neighbors a lot of craziness. That’s right…you go in the coop. Second, lesson learned: coop latches will be double checked before I leave the house (Nick has seen them push open the coop door to get outside if the latch isn’t fully set) and chickens will no longer be allowed any full free ranging time unless I am physically outside with them. You can still enjoy the sweet taste of grass from inside the mobile tractor. I love Chicken Run too, but – sorry, girls – it’s mobile tractor time from here on out. What are your experiences with escapee birds? BWAHAHA that's kind of awesome. Thank goodness for good neighbours! Gotta love the escape chickens. We actually had a chicken that we named Escape Chicken. It started when we found her in the garden every day. We clipped her wings which we thought helped because she wasn't getting into the garden anymore. Then we went on vacation. My friend called to say she had found Escape Chicken in the neighbor's yard sans tail feathers thanks to said neighbor's dogs. So she clipped one wing even shorter. She was then back to getting into the garden. The day we decided that it was time for our rooster and Escape Chicken to meet the big frying pan in the sky (after all, Escape Chicken was now destroying all of our seedlings) Escape Chicken made a break for it. We came home and she was nowhere to be found. Two days later she was found in the same neighbor's yard, this time without any feathers. Poor naked Escape Chicken. So we put her in a crate to recover. The goats helped her escape from that so we put her back in the crate, which was now located in the coop – where the goats couldn't assist her. Well, long story short – she somehow got the door opened and escaped. When her feathers returned and she was back to her old fence hopping antics we finally had to get rid of her. She made one last escape from the cone of demise before meeting her end. Unfortunately, any escapee chickens readily become dinner for the rest of the wildlife around here. We get escapees all the time. How they react depends mostly on the time of day, but partially the hen's character. In general though, all the girls explore some but end up trying to get back into their tractor. Most of the time they end up pinned up against the outside wire of the tractor and are easy to recover. Otherwise we've been distracting them by blocking their path with a loud child while I sneak up behind. That works too. I'm excited to have them walk directly from the tractor to the run, then up the ramp into the coop. Works well most of the time for my brother. We'll try that tomorrow. 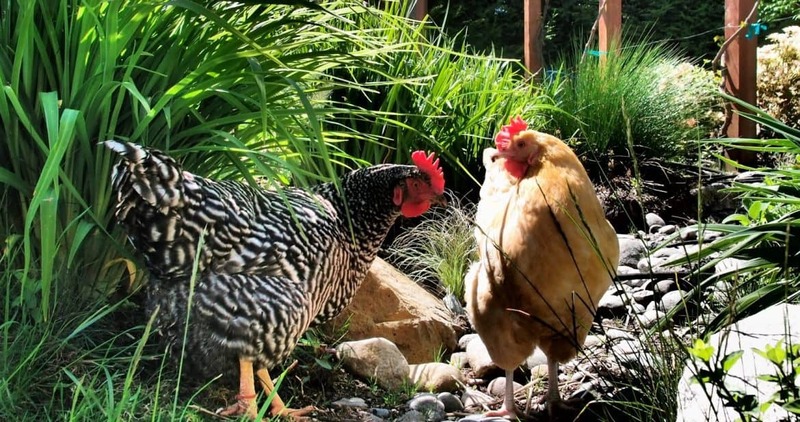 We had semi-feral chickens down the alley from us one summer – i don't know if they were a deliberate free-range flock, a neglectful homeowner's flock, or left behind after the owner moved away. But they were ALWAYS there, up in a tree watching the alley, except when they were running around in the alley. I've lived places where there were often escapee cows or hogs, though – you just shoo them off the road and go home & call the owner to let them know. One of my exes had some epic "escaping beef bull" stories from when her grandfather started getting a little too old to be in charge of the gates. Hope they didn't make a mes of your gardens! I have learned to keep black oil sunflower seeds on hand at all times…they are a magnet to the escapee…broccoli works too!